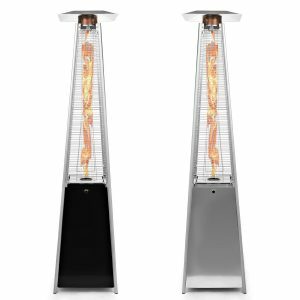 The pyramid patio heaters from Thermo Tiki are well known as a quality product and also a very nice looking patio heater. We will have a good look at the Pyramid patio heater with dancing flame that is available in Black and Silver. In general many people who use to have a standard heater are changing to the better looking patio heaters who are coming available. The measurements says 54 x 54 x 8 The real height is 7.5 foot. Weight of his heater is 58 pounds without the propane tank installed. 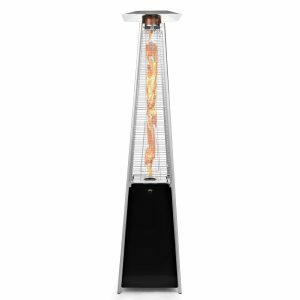 There are some questions people ask before they decide to purchase one of the AZ pyramid patio heaters and here are the ones we have seen the most and the best answered. Q: Can it run on natural gas? There were a few things that we found that need some explanation. An average patio heater will keep you warm on a cool night. If you think it will keep you warm on a cold winter night and it will keep you warm on you deck? That will not happen. When used on a cool summer night it will work great. Just like the other pyramid patio heaters we review this one is also in compliant with CSA standards. The USA standard for this type of patio heater. The used materials are high grade steel and aluminum and we could not find complaints about the quality of the materials. The 4 feet long and 4 inch in diameter glass tube is mentioned as very nice and give a spectacular flame dancing. Some complaints about the push button ignition not working to well, but most people reported no problems with the ignition. Could be that the battery needed replaced. Seen some remarks about that in the customer reviews I found. The output is 38000 BTU’s but they claim that there output is real and not inferior like other heaters. We can not support that claim of course. There is no proof for that in my opinon. The adjustable flame works also good although most people use it on the highest setting. Moving it around will only work when you tilled the heater. Someone mentioned that you need two people to move it, but I don’t see why. He was the only one mentioning that. 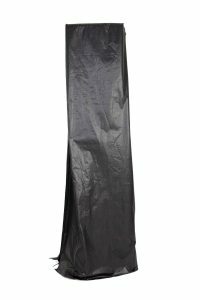 Like many other patio heaters people expect an outdoor heater that will keep them warm no matter what the outside temperature is. This is not the purpose of any patio heater. It is to keep you warm on a cool summer night and not on a winter day. The output is simple not high enough for that. With 82% of the users giving it a 4 or 5 star rating the average is a 4.1 out of 5 stars. Most lower raters complaint about it not giving of enough heat. Read what we wrote about that earlier and you will understand that I do not agree with that. The average to put it together was about 2.5 hours and that means that there is a lot of assembly to be done. If you are not so handy make sure you have some help available that has experience. The two available colors Silver and Black are very well chosen and will fit about any garden, deck or patio furniture and decorum.